TAIPEI, Taiwan — The head of Foxconn Technology Group is planning to step away from day-to-day operations at the world's largest electronics provider and said Tuesday that he is mulling a run for president of Taiwan. 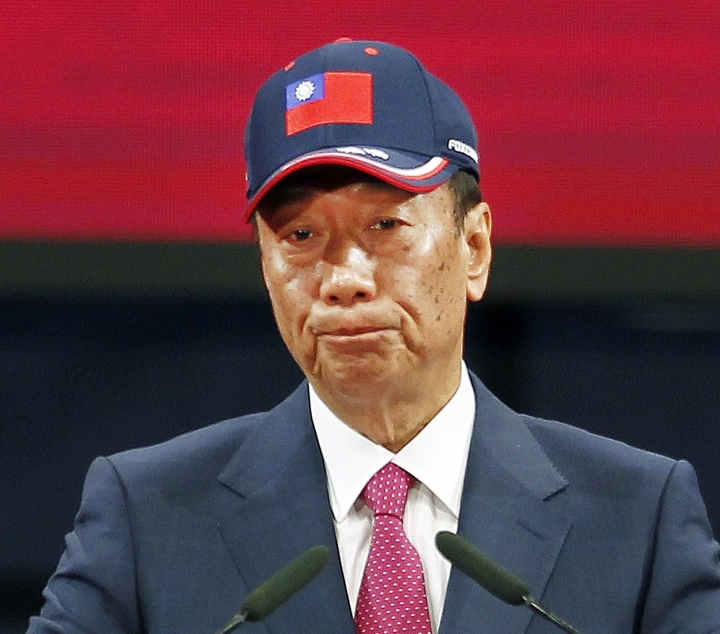 Terry Gou said he would make a decision "in a day or two" on a possible presidential bid, according to Taiwan's official Central News Agency. He said that if he decided to run, he would take part in the opposition Nationalist Party primary rather than mount an independent bid. The Nationalists favor closer ties with Beijing, a policy that accords with Gou's massive business interests in China. Any candidate is expected to face a crowded field in the 2020 polls, in which President Tsai Ing-wen of the pro-independence Democratic Progressive Party says she will seek a second four-year term. Gou told reporters Monday at an event in Taipei that he would step back from daily operations at Foxconn. He said he wants to work on a book about his management philosophy honed over 45 years and prepare a younger generation to eventually take over operations at the company. Foxconn counts Apple, Google and Amazon as customers and has said it will build a manufacturing facility in the U.S. state of Wisconsin. "The major direction of the company will still be guided by me. But I will gradually step back from the front-line operations," the 69-year-old Gou said. "I feel that I should tone down my personal influence ... let young people learn sooner in order to take my position as soon as possible so that I can have more free time to work on long-term planning for the company's future." Foxconn announced in 2017, to much fanfare, that it planned to invest $10 billion in Wisconsin and hire 13,000 people to build an LCD factory that could make screens for televisions and a variety of other devices. The company said last year that it was reducing the scale of what was to be made in Wisconsin, from what is known as a Gen 10 factory to Gen 6. Those plans now appear to be in flux, although the company says its Wisconsin campus will house both an advanced manufacturing facility and a center of "technology innovation for the region." Foxconn earlier this year cited a changing global market as requiring a move away from making LCD panels in Wisconsin. Apple is Foxconn's main manufacturing customer and it has forecast a drop in revenue from the Chinese market due to decreasing demand for iPhones. Asiashift focuses on Asia region news with extensive coverage on government and political topics while maintaining its neutrality position. Copyright © 2015 - 2019 Asia Shift. All Rights Reserved.